The University of the Philippines (UP) College Admission Test (UPCAT) results for Academic Year AY 2015-2016 are out online on Monday, January 12, 2015. UPCAT was administered last August 16-17, 2014 in various campuses nationwide. The official results are already posted at the UPCAT website and on mirror sites. Note that UP used mirror sites to avoid slow loading of results page due to high volume of traffic on their server as results are released. Stickbreadsolutions and Preginet are the site mirrors that will redirect to UPCAT 2015 Results page. December 21, 2014 Update: Captured from a private message of UP - Diliman Facebook account and a certain Nino said that results will arrive before Christmas. It means that any time from today until December 24, results are probably be posted at UPCAT webpage. December 22, 2014 Update: Official Twitter account of UP (@upsystem) posted an update which says that January 2015 is the possible period of release of UPCAT results. Section VI of the #UPCAT Gen. Info. (http://t.co/DmzrVSaGAC) still provides Jan 2015 as possible period of release of results. Thank you. January 4, 2015 Update: Reports said that UPCAT results are out online before the start of second semester classes in UP. Based on the proposed academic calendar of UP for AY 2014-2015, 2nd semester will start on Thursday, January 15. It means that official results will be released anytime between January 4-14. 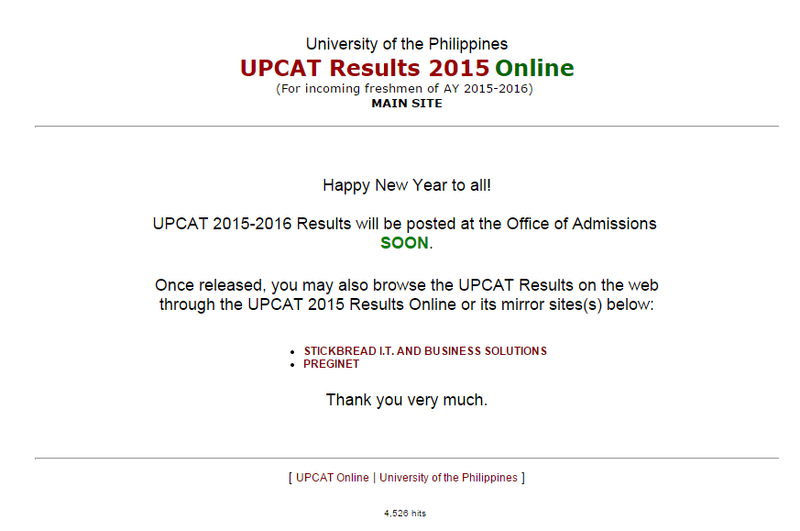 January 6, 2015 Update: UPCAT Results 2015 out online SOON. January 12, 2015 Update: UPCAT results 2015 officially released online. Aside from the online availability of results, UP announced that list of qualifiers from each school will be sent to the Principal. Individual notices will also be sent to all examinees. Last year, there were over 82,000 examinees who took UPCAT. According to reports, only around 17% usually passed UPCAT every year or can be translated to an average of 10,000 out of 60,000 examinees can hurdle the exam. UP said that to maintain its high standard of education and to maximize its limited resources, they need to limit slots for freshman admission to each campus and to its various degree programs. The UPCAT is consists of 4 subtests: Language Proficiency (English and Filipino), Science, Math and Reading Comprehension (English and Filipino). Standardized scores on these subtests are combined with the weighted average of final grades in the first three years of high school to determine qualification into UP. Moreover, to implement the policy of democratization to make the UP studentry more representative of the nation’s population, socio-economic and geographic considerations are factored in the selection of campus qualifiers. UP is highly committed to admitting the best students and providing increased access to quality higher education. All UP students are provided partial tuition subsidies by government appropriations, but additionally the University also has a Socialized Tuition System (STS) which provides possible tuition discounts and/or additional financial assistance for qualified students in the form of monthly subsidies for living and travel expenses and a semestral book allowance. Students may also avail of tuition loans and short-term loans from the Student Loan Board. UP Oblation Scholarship is given to the top fifty UPCAT qualifiers.The benefits include free tuition, miscellaneous and laboratory fees, a semestral book subsidy and a monthly incentive and transportation allowance. 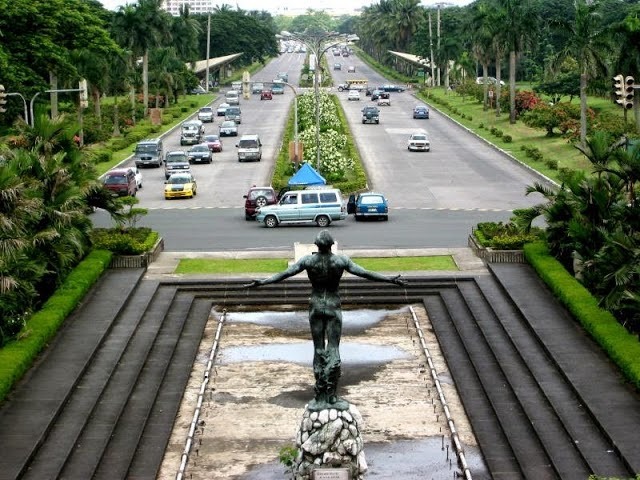 Recipients may enjoy the UP Oblation Scholarship throughout the normal length of time required to finish their chosen degree program, provided they maintain the required grade point average. For those in the accelerated medical program (INTARMED), however, only the first four years are covered by this grant. Don't forget to Share this post if you find this informative. Like Us on Facebook and Follow Us on Twitter. Good luck to all takers!